A new model on how supernovas are formed was presented that can explain certain properties of supernovas that existing models cannot. The new model depicts the formation in three dimensions compared to previous one or two dimensional models. In the new model, the material in the stars are violently mixed together which causes them to expand, contract, eject and then explode into a supernova. This 3D model is described in the article, "Chaos and turbulent nucleosynthesis prior to a supernova explosion" by David Arnett, Casey Meakin and Maxime Viallet which appears in the journal AIP Advances. Supernovas are stars that run out of fuel or reaches critical mass and explodes. The explosion from a supernova can expel stellar materials at a rate of about 30,000 kilometers per second (10% of the speed of light). A supernova remnant is formed after the explosion and its boundaries are based on the shockwave from the exploding supernova and is made up of the ejected stellar material of dust and gas. The Crab Nebula is the most popular and well known supernova remnant in the Universe In 1987, a supernova erupted in the Large Magellanic Cloud and afterwards formed the Supernova Remnant 1987A. It was the closest exploding star observed in modern times. Image Caption: Three-dimensional turbulent mixing in a stratified burning oxygen shell which is four pressure scale heights deep. The yellow ashes of sulphur are being dredged up from the underlying orange core. The multi-scale structure of the turbulence is prominent. Entrained material is not particularly well mixed, but has features which trace the large scale advective flows in the convection zone. Also visible are smaller scale features, which are generated as the larger features become unstable, breaking apart to become part of the turbulent cascade. The white lines indicate the boundary of the computational domain. A powerful, new three-dimensional model provides fresh insight into the turbulent death throes of supernovas, whose final explosions outshine entire galaxies and populate the universe with elements that make life on Earth possible. 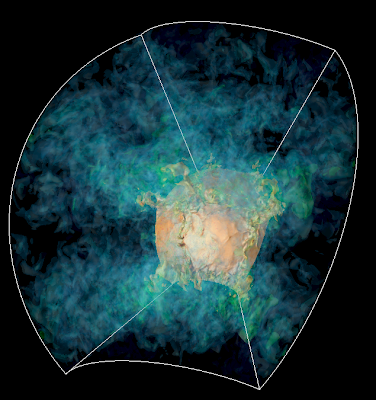 The model is the first to represent the start of a supernova collapse in three dimensions, said its developer, W. David Arnett, Regents Professor of Astrophysics at the University of Arizona, who developed the model with Casey Meakin and Nathan Smith at Arizona and Maxime Viallet of the Max-Planck Institut fur Astrophysik. Described in the journal AIP Advances, it shows how the turbulent mixing of elements inside stars causes them to expand, contract, and spit out matter before they finally detonate. Arnett, a pioneer in building models of physical processes inside stars, traces his fascination with turbulence to 1987A, the first supernova of 1987. Located in a nearby galaxy, it was bright enough to see with the naked eye. The star puzzled astronomers, Arnett recalled, because the material ejected by its explosion appeared to mix with material previously ejected from the star. Existing models could not explain that. Instead, the existing models envisioned a star as a series of concentric circles, with heavier elements like iron and silicon in the center and lighter elements like carbon, helium and oxygen towards the surface. The heavier elements exert a powerful gravitational pull on the lighter elements. This compacts the star, increasing pressures and driving temperatures high enough to create neutrinos. As neutrinos go shooting out of the star, they take energy with them. Ordinarily, taking energy from a hot body would cool it. In this case, the lost energy reduces the ability of the lighter gases to fight the core's gravitational pull. Instead of cooling down, the star contracts further. "It heats up and burns faster, making more neutrinos and speeding up the process until you have a runaway situation," Arnett said. Scientists reached these conclusions by analyzing light and radioactivity from supernovas, then creating models of physical processes that yield similar results. The resulting models are very large and complex. Researchers must simplify them in order to run them on supercomputers. They do this by limiting their models of flow to one or perhaps two dimensions, and making assumptions about how flow in other dimensions might behave. This generally leads to models that show one process smoothly blending into one another. Arnett's 3-D models show something entirely different: a wild, turbulent interior that spits out star remnants prior to the final explosion, much the way rapidly heating a pot causes water to boil over the edge. "We still have the concentric circles, with the heaviest elements in the middle and the lightest elements on top, but it is if someone put a paddle in there and mixed it around. As we approach the explosion, we get flows that mix the materials together, causing the star to flop around and spit out material until we get an explosion," Arnett said. "That's what see in supernova remnants," he added, referring to the ring of heavy and light elements that form nebulas around stars that went supernova. "We see those ejections of star material, and how they mix with material expelled from the star during its final explosion. Other models cannot explain this," he said. Arnett's model is based on better data and faster, more powerful computers. "It would have taken 40 years to run these models on the supercomputers I used in the 1970s. They were feeble compared with my smartphone," Arnett says. Researchers also needed more data. Supernovas are extremely rare and difficult to find. Over the past decade, however, smaller observatories like the Katzman Automatic Imaging Telescope (KAIT) and Palomar Supernova Factory, have been using sophisticated electronics to sweep the sky, looking for miniscule changes in brightness that might indicate a supernova. When they find them, researchers turn larger telescopes on them to gather more detailed information. The data has produced a new understanding of how some stars die. "Instead of going gently into that dark night, it is fighting. It is sputtering and spitting off material. This can take a year or two. There are small precursor events, several peaks, and then the big explosion. "Perhaps we need is a more sophisticated notion of what an explosion is to explain what we are seeing," Arnett concludes.